Nice to see the results! (I must say, any delays in them were due to me and not Chipster!) I didn't solve the other levels as they used a lot of the fancy CC2 stuff and were too complicated for me. I do want to reply about my own entry though. I didn't know it mattered where I wrote the short comment. I made the level for three rule sets, so it was simplest to keep it in the hint field. The hint text is also a bit of a misdirect, as the puzzle aspect also applies to the upper area of the level. Or at least that was the idea, which didn't really work out. I was hoping that if the dodging in the upper area was too difficult, you could alter the tank movements in such a way that visiting the top area more than once made it easier. Maybe this works in MS but not really in Lynx or CC2. 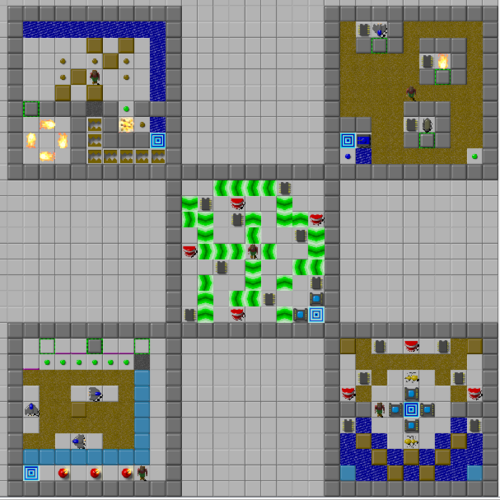 Had this not been a "walls of" creation, I would definitely have made the upper area also have a simpler way to solve it with maybe some more safe spots. Removing that one horizontally moving tank (on the fifth row) was something I considered, but doing so just took away all the stuff I found interesting in that area, so I left it in. In hind sight, I should have removed the one that was on the third row (or even pointed it in the other direction, giving the player a better visual queue based on the lower tank). I didn't add any bonus flags either, because I believe not every CC2 level needs to have them. I did experiment with them in the upper area of the level, but decided against them for compatibility with CC1. Perhaps overall my mistake was to even try making such a level. When one tank movement worked nicely in one rule set, the collisions in another rendered it different or even unsolvable. Thanks for the feedback and the judging! A big thanks to Ryan for making all these template sets! It does sound like it wasn't always a small task, but they really did help out! I know I was inspired by going through your set, not the original. Hi. Let's see if I can post some scores from time to time, possibly with comments. CCLP3L #38: 308 L (+7, b+1, Wireframe) If you look at the evolution history, my only regret is I didn't get to report the 306. (Did you see the evolution of JL1??) A nice level that taught me an important thing: if you think you know a good route to a level, check for updates to it before posting your awesome score. This could actually be a blog post at some point. I don't think I'll have much time to work on many new scores, but I will try to post my old ones gradually, as I need to get my totals straight. I too enjoyed these! Highlights for me were September Pumpkin and Seeing the Superior Color, plus maybe Not Aargh. Thanks for sharing! I posted a few comments on Discord, but might as well copy them here... I played through the set. Very fun. Didn't solve Mix Up yet, as the blue key was erased in Lynx. The time limits were stricter in most levels than I might have set them, but I got used to that and it was a fun part of the whole set. However, for a few levels the time limit was particularly strict in Lynx due to timing differences, which I would suggest revisiting: Eeny Miny Moe, Block Out, Skelzie, at least; then next Sampler, Three Doors, Traffic Cop; and maybe finally Partial Post, Deepfreeze, Paranoia and Metastable to Chaos. 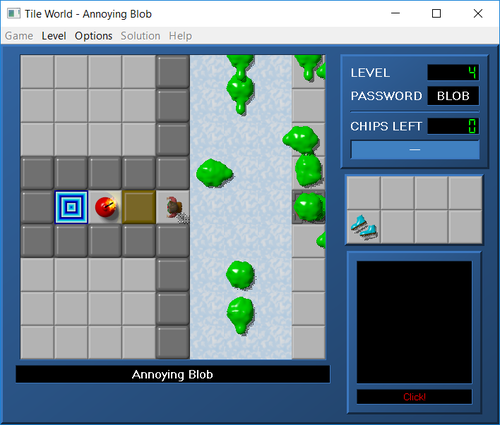 I also wouldn't have minded if Writers Block would have had a few more chips required, since it was untimed. Refraction might have been ok with just one blue button, but that's just one detail. In general I really enjoyed all the ways you handled the levels, keeping the concepts very recognizable and focusing on what the essence of a level usually was. My favorites in the set were: Tossed Salad, Knot, Ladder, Road Sign, Doublemaze, Pentagram, Mind Block. Thanks for sharing! I played through most of these levels and took a look at the tougher ones in an editor. I'm no expert designer myself, but I can tell you what kind of things came to mind when I was playing your levels. Here are some first impressions Short tutorial (the first one). I liked this. A fine start to the set. Two Gliders. And then we get to some complexities. The puzzle is nice, though the red key red herring is not something that really enhances it. I don't know what the trapped Glider is for. I wouldn't mind seeing more levels like this. Getting outside. This was a bit too complicated for me, particularly as a third level. I like trying a set blind, and the first few levels are the ones I focus on the most. They give me an impression of what to expect from the rest of the set. If you're making stuff like this that take me a long time to solve, I rather jump ahead and pick the best ones to use my time on. 18 buttons. I really enjoyed this concept. I even tried making a level myself that would borrow it, but just throwing together rooms didn't end up too great. Your level doesn't make things too difficult, and I feel there is potential here. The hint says you don't like this level, but I think it could be improved greatly by just changing the ending mechanism. Why do you require the player to go through the traps twice? To make sure the Gliders really are already in a loop? Still, there are better ways to do this. The first thing that comes to my mind, is having a corridor of bombs, Chip goes through a pop-up, presses a tank button, tanks move onto traps, and as the traps open, they destroy the bombs. This way Chip is not trapped in the traps himself, and it's enough to trigger the buttons once at any point instead of exactly when Chip is in the corresponding trap. (And if you want to require pressing the traps twice, you can make two waves of tanks.) Hopefully that makes sense, and maybe instead of fixing this level I'd like to see a sequel that refines the concept. Suspicious looking level. Not much to say about this one. It's an item swapper that you have to think about. The buttons aren't situated in a way that makes it easy to deduce what each one does. I like hiding the hint, but still all walls as blue is a bit bland. Water all around. Ice Cavern. Skipped these one, sorry. I do wonder about how you are capitalizing your level names. And while on that topic, some of the level names are not memorable, so maybe spend a little more time on those when you make a level you like. There's a whole page for this on the wiki, or you can ask on Discord for inspiration. Monster exchange. I liked this puzzle. (It's the only one I remember seeing a preview of on Discord, plus a section of Dottet holes). 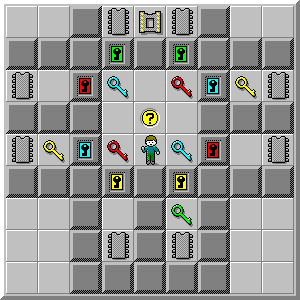 If only the game allowed for more trap connections, this would be a cool concept to use in a longer level, with small puzzles building to a larger one. As it is, this could work well as one section of a larger level, though having it as it's own level is fine too. Dungeon. I skipped this one. When there's a lot going on on the map, it's just easier for me to move on and see if I like other levels more. An unpleasant journey. A fine dodging level. Not too easy, but also not too long. 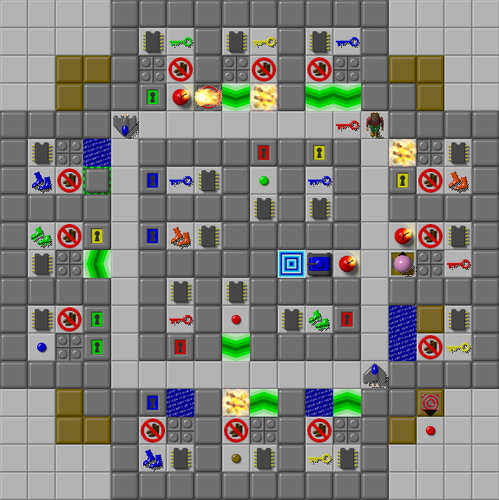 Doesn't work in Lynx due to the blue key (and the buried tile you added), but you could swap colors around and get it working, though then you should also rework the trap area too. (It works fine with just one Fireball, and in Lynx the other one escapes so another fix for that could be to change the surrounding dirt so it ends up elsewhere than it does now.) Chaotic session. This looks like one of those levels that I wouldn't like, but as I played it I found it clever though a little too tricky. I would have liked it more if it had been half as short, as once I figured out one side of the level and then attacked the other one and died, I pretty much had forgotten how the first side worked. Down the slopes. Some interesting stuff here. I was a bit disappointed with the final trap/cook when I got stuck at (31,15). WHY? There was no fun in that. But I did enjoy the puzzle. Dottet holes. This looks really clever and it is. But there are so many sections that all require such precision. Why not split these all up into smaller levels? What's wrong with small clever levels? I didn't work through all of this yet. Short tutorial. I like sequels to levels, but at least give them a new name. This was too complicated for me to play without a map, so I went on to the next one. Machine out of control. I really liked this one. This is a sort of slow dodging chaos that I haven't really seen. The structure was good too, allowing me to pick which way I went, and having two sections. This built up excitement to reach the second section well, and having more could have been too much. Vacation on blue island. Didn't get to this one yet. Fuse. I looked at this in the editor for 15 minutes and didn't get far along. It's really complicated and looks like everything needs to be done very precisely. The concept looks cool though. I'm just confused on how to do everything I need to do, and where exactly I needed to go. When are blocks used on traps and when are they for bombs and when are they used for deflecting Fireballs? Not sure if this needs any fixing or anything, just telling you the things that were enough to throw me off. Eating Mushrooms. The time limit was pretty strict. If you really want someone to solve the puzzle on their first attempt, don't add so much stuff that does nothing. But it looks good, so I would rather see a higher time limit. So far I have enjoyed the levels. Many of them were pretty difficult and had a lot going on. I will gladly play a difficult level, but if you can tone down some of the visual complexity, that would be welcome. Don't always use all the tiles. Use a bit more space in your rooms. Get to the meat of the puzzle. While you had some cool ideas and clever little rooms, your best levels were the ones where the objective was clear because then those ideas were on display more. I will gladly play more of those. Thanks for sharing! Results! Anonymous - not ranked - (Sna Lad, Was Spa, Cvs, DnQ) Though the name "Was Spa" is pretty neat, I hope this naming convention doesn't take catch on. But who made these and why are these ranked last... I was going to make a joke about an entrant wanting to remain anonymous and I can't give you Chip Cup points as a result, but I think I've used similar jokes before. I made these levels myself. I was just embarrassed to admit I made so many. I guess I just liked the theme. (but let's not make it a habit to send in levels under false names) M11k4 - 7th place - 5pts - (Mini Pearl Diving, Mini Checkers, Mini Game, Avalanche for Dummies) Of these levels, I like Mini Checkers the most. You can see from these that I was aiming for something very simplistic when I was thinking of the theme. I'm still happy to have gotten so many quality levels from others even though they were not this simple, even though they were simpler than the originals. That's CCLP3 for you ElaineSpencer - 6th place - 6pts - (Annoying Blob) This is a fun modification of the original level. It's also solvable in both rule sets without any luck required. However, I'm not sure how much simpler this is than the original. There's one fewer bomb than before, so I guess it's two thirds simpler. This would be a good fit for CCLP3 Blobs edition. I'm happy you joined in the fun though! geodave - 5th place - 7pts - (Suspended Animé) This level certainly takes the concept from the original and makes it much simpler. Collect chips, boots and keys, then things start moving when you are heading to the exit. The layout is very straight-forward, which can be seen as either the lack of a puzzling task to accomplish or as a way to keep things easily digestible. Indyindeed - 4th place - 8pts - (Knockturn Alley, In Deepest Slumber) Two level names that relate to each other. A subconscious expression of a tired designer, or completely intentional play on words? The first is a cool combination being inspired by Maginot Line and the walls of Gate Keeper. I think the structure here has potential to be a fun task, but I personally would have simplified some parts to make the whole a bit more elegant. It's a very enjoyable level though. For the second one, again you built a mechanism from one level into the walls of another. I think this is a better tactic when both levels were well-loved, but here I'm not sure what the end result is. I didn't not enjoy playing this though, so I feel you have the makings of a good designer in you and just need some practice to let your ideas shine. RB3ProKeys - 3rd place - 10pts - (After the Avalanche) I like this. Of course I like this, as Avalanche is my favorite level. But it's a hard concept to recreate correctly. Here you end up with seven rooms (so it's not too big), but you add the element of losing a some blocks on the way so there aren't always that many to move, plus rooms have more than one block in them anyway, so there is less rooms to get through as well. The design works fine, with a few things even sticking out as cool (like the ff stuff). This level leaves me wanting more, so you did something very right. chipster1059 - 2nd place - 12pts - (Toggle Box, Flame Mixture, Singapore) Toggle Box level could have been even smaller and better for it, which really shows that the original went too far. Having said that, I found the structure of this one to not be quite as interesting nor did it flow quite as well in the individual sections. I am left feeling I'd like to see an even simpler version of this level, yet I fine entry none the less. In Flame Mixture we have a mixture of Map the Path and Dolly Mixture, with a hint of Flame Thrower. On the surface this sounds like a good recipe, but does it leave a good taste? I think requiring all the chips is a mistake, as it leads to game play at the end of the level that does not feel like any of its inspirations. The size might be about right, but just a bit smaller and a few fewer monsters would also have been ok. I'd get rid of the hint as well. I think you cooked up a good cake that we just need to bake a bit more to allow all the flavors shine. I think you hit it out of the part with Singapore! It feels very much like Tool Box but is smaller without being trivial. The choices are cool and I can see myself enjoying this even when I need to play it again for the Time Trial Ihavenoname248 - 1st place - 15pts - (Spiraling Out of Control, Qualification Circuit, Rainbow Refraction) For Spiraling Out of Control, I like the twist on this concept, but man did win end up with a level that's still on the long side of things. Maybe I think that because my expectations for this competition were different than what some of these concepts required. I'm still happy this level exists, and it is a fine show case of how you know how to execute on a concept. Qualification Circuit I enjoyed playing. You took the concept and made it your own. Though the level is smaller than Grand Prix, it's still very complicated. Is there any way you could simplify it a bit? Let's get rid of some of the teleport stuff, shall we? I see that they are inspired from the original, but they don't add anything good to this level. I do like the puzzles though; they flow smoothly and the use of space is efficient. Rainbow Refraction level is everything I wanted from this competition! Thanks for creating it for me It is more complicated than I thought people would aim for, but everything is just as it should be. A very well deserved first place for just this level. I believe this seals the Chip Cup 2018 in your name, with a whooping four wins in the year! Congrats! I haven't updated the set yet with the designer credits, but I'll get to that. I wouldn't mind if a few of the levels were still updated, perhaps incorporating some of the feedback. I just like these levels a lot and wouldn't mind seeing them honed a bit more Thanks again to all participants! I'm sure we'll have more great competitions this year! ...like the January 2019 Time Trial, which will still be part of last year's Chip Cup apparently... -Miika EDIT: also, for the mini create, everyone (that's Indyindeed, geodave, chipster1059, Flareon350, Ihavenoname248, M11k4) are awarded 5 Chip Cup points! I opened this topic expecting a download of a modified version of Tile World where sounds were permanently disabled. Here are the levels submitted to the October 2018 Create Competition - Simple as CCLP3. This first version does not contain designer information, so you can form your opinions on the levels before that and the results are revealed. We had about seven people make a total of about twenty levels. They are ordered in this set according to the order of their inspirations in CCLP3. Thanks to all participants! Thanks for playing too! Be sure to share your takes on the levels! Hope you enjoy!